My favorite paddle last week came on a windy day – with wind in the face while going upstream. 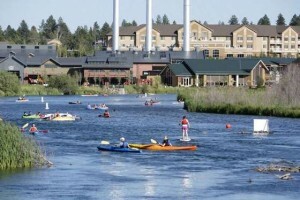 As I dropped my board into the Deschutes River crowded with traditional summer-time tube-floaters and all types of paddle craft I was thinking about getting a nice interval training session. I was using my KIALOA Tiare Adjustable paddle extended almost 3 inches longer than when I used it last week for surfing. In order to monitor a bit about my training paddles I use Nike+ on my iPhone to get feedback on minutes per mile. I wear a Polar heart rate monitor because sometimes I tend to go too hard for too long and start to erase the fun factor. The upstream/wind-in-face leg: Imagine my surprise when I heard the robo-voice from the Nike+ app say, ” One mile. Average pace 18 minutes per mile.” Okay,” I thought to myself, “When the breeze is in my face and I am going up current in this section of the river I usually average 20 minutes a mile.” Weird, I wasn’t trying so hard, my rate of perceived exertion (RPE) was medium, maybe a 6 out of 10. Heart rate was in a manageable range. What was making a difference? First of all, I did feel powerful. My board seemed to be gaining power from my legs with each paddle – and the only thing I was doing differently was maintaining a more complete rotation of my upper body. Core engaged and tail tucked. 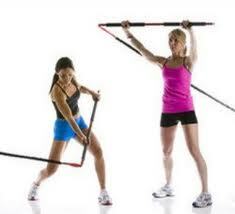 I have been training on non-paddle days with the TRX system. A neutral spine is a prerequisite to doing the TRX program. Perhaps a regular routine of that practice at that had provided me with a better “engine.” I have had a habit of bending at the waist, particularly when skiing. Muscle and body memory around creating that more upright, neutral spine might be a valuable transfer to more than just my SUP technique. Tiare Paddle In the Quiver: The team at KIALOA Paddles has lately been offering much more. On my “favorites” is the amazing Tiare paddle blade. I particularly like the adjustable shaft with a paddle blade made for especially for women. Even though the Tiare is smaller in square inches, the bottom third (where the catch takes place) is wider. This allows me to really feel and accentuate the catch of my paddle stroke – thus gaining more effective power as the stroke plays out. In addition, Dave Chun explained that the flex of the blade allows me to “feel” the water more effectively throughout the stroke. Dave shared this in more detail, “I feel a good paddle needs to flex. The flex gives feedback to the paddler, which makes for a more efficient catch and pull. What the blade is doing in the water is important if a paddler wants to continue to develop their technique. I believe stroke technique is a lifelong journey. Many paddlers only think in terms of fitness when training. But, consider how most athletes are trained for their sport. Components of the sport are broken down in to small segments and drilled over and over again. Practicing an inefficient paddling stroke will get you fit, but it will limit the threshold of one’s overall speed. The stiffness or flexibility of the paddle must be scaled to the strength of the athlete. Generally speaking, men are larger, and thus stronger. The typical woman, cannot “load” a blade or a shaft designed for a man. It is not simply a matter of building a blade with less surface area. The blade, as well as the shaft, must load under a woman’s energy output. Designed and scaled for women every step of the process: The Tiare was designed during the tooling/molding phase as a women’s paddle. The rib is narrower and lower in height than the Insanity. It was scaled to a women. On our part it was a commitment to our women’s program. The Tiare mold or “Shorty” as we nicknamed it, will never be used for an all-around or man’s paddle. Simply, I am STOKED!!!! Off to about 8 weeks of training before I use my Tiare paddle in the Colombia Gorge Paddle Challenge – will we see you there? I will be testing the Tiare that is being developed for women who race by the innovative team at KIALOA Paddles. Look for us in the KIALOA Paddles tent for some “talk story” fun. This entry was posted in Equipment, SUP Racing by Water Words. Bookmark the permalink.